This past weekend my wife and I, and a group of other friends, participated in our first half marathon; the Bluenose in Halifax. It was a phenomenal event with close to 11,000 participants in the various races held during the day. There were just under 1800 running in our race. 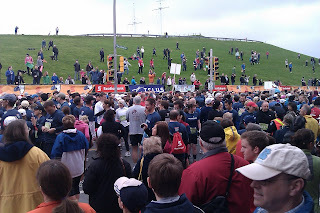 I headed to the starting point at the base of Citadel Hill with a combination of excitement and nervousness hoping that I'd be able to just put one foot in front of the other and finish the race. At 9:25 am the gun sounded and we were off, racing through the streets of the city. I was amazed at the energy I was able to gain from the thousands of people lining the race course, especially the kids with hands outstretched looking for a high five from the runners. I really had no idea how long it would take me to finish but deep down I was really hoping to finish the 21km course in under 2 hrs. Coming up to the finish line and seeing the clock ticking in the 1:52's was an amazing feeling. I crossed the finish line in a time of 1:53:25. Teresa finished the race in a time of 2:15:02 which was 5 minutes quicker than what she was hoping. Here are a couple of pictures from the event. Crowd before the start of the race. Me and Teresa after the race. We both seem to have caught the running bug and spent this evening scouting out our next event. 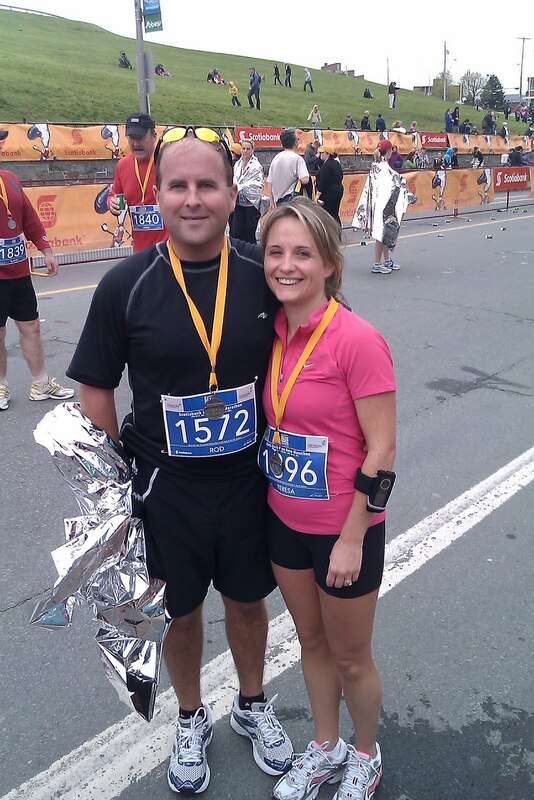 Plans right now are to run the PEI half marathon this October but we will likely run in several 10K races over the summer.